ذلولی, احمد, خامه چیان, ماشااله, نیکودل, محمدرضا, جمشیدی, امین. (1392). ارزیابی زوال‌پذیری نمونه‌هایی از تراورتن‌ها در مقابل تبلور نمک با استفاده از پارامترهای شاخص تجزیه و سرعت تجزیه. نشریه انجمن زمین شناسی مهندسی ایران, 6(شماره 1 و 2), 52-66. احمد ذلولی; ماشااله خامه چیان; محمدرضا نیکودل; امین جمشیدی. "ارزیابی زوال‌پذیری نمونه‌هایی از تراورتن‌ها در مقابل تبلور نمک با استفاده از پارامترهای شاخص تجزیه و سرعت تجزیه". نشریه انجمن زمین شناسی مهندسی ایران, 6, شماره 1 و 2, 1392, 52-66. ذلولی, احمد, خامه چیان, ماشااله, نیکودل, محمدرضا, جمشیدی, امین. (1392). 'ارزیابی زوال‌پذیری نمونه‌هایی از تراورتن‌ها در مقابل تبلور نمک با استفاده از پارامترهای شاخص تجزیه و سرعت تجزیه', نشریه انجمن زمین شناسی مهندسی ایران, 6(شماره 1 و 2), pp. 52-66. ذلولی, احمد, خامه چیان, ماشااله, نیکودل, محمدرضا, جمشیدی, امین. ارزیابی زوال‌پذیری نمونه‌هایی از تراورتن‌ها در مقابل تبلور نمک با استفاده از پارامترهای شاخص تجزیه و سرعت تجزیه. نشریه انجمن زمین شناسی مهندسی ایران, 1392; 6(شماره 1 و 2): 52-66. یکی از مهمترین عوامل تأثیرگذار روی دوام و زوال­پذیری سنگ­های ساختمانی تبلور نمک­های محلول است. سولفات منیزیم از نمک­های متداول و مخرب است که می­تواند باعث زوال­پذیری سنگ­های ساختمانی شود. از این رو ضروری است قبل از انتخاب یک سنگ برای استفاده در نمای بیرونی ساختمان­ها به این موضوع توجه ویژه­ای شود. در تحقیق حاضر از پارامترهای شاخص تجزیه و سرعت تجزیه برای ارزیابی زوال­پذیری نمونه­هایی از تراورتن­ها در مقابل تبلور نمک سولفات منیزیم استفاده شده است که می­توان به عنوان یک معیار مقاومت نمونه‌ها در مقابل تبلور نمک از آن­ها استفاده کرد. بدین منظور 15 نمونه تراورتن از مناطق مختلف ایران تهیه شد و علاوه بر مطالعات سنگ‌شناسی، تعدادی از ویژگی­های فیزیکی و مکانیکی آن­ها شامل چگالی، تخلخل، جذب آب، مقاومت فشاری تک­محوری و کششی برزیلین اندازه­گیری شد. سپس آزمایش تبلور نمک در محلول سولفات منیزیم تا 60 چرخه انجام شد و بر اساس افت وزنی و همچنین وضعیت ظاهری نمونه­ها، پارامترهای شاخص تجزیه و سرعت تجزیه برای هر نمونه تعیین و ارتباط آن­ها با تخلخل مؤثر، مقاومت کششی برزیلین و افت وزنی نمونه­ها با انجام آنالیزهای رگرسیون برقرار شد. نتایج نشان می­دهد سرعت تجزیه همبستگی بالایی با تخلخل مؤثر، مقاومت کششی برزیلین و افت وزنی نمونه­ها دارد در صورتی که برای شاخص تجزیه اینگونه نیست. همچنین نتایج نشان می­دهد ویژگی­های ساختاری نمونه­ها، تخلخل مؤثر و مقاومت کششی برزیلین از عوامل مهم کنترل کننده دوام نمونه­ها در مقابل تبلور نمک می­باشند. 4PhD student, Department of Engineering Geology, Tarbiat Modares University, Tehran-Iran. Salt crystallization is one of the important factors on durability and deterioration of building stones. Magnesium sulphate is a common salt that can lead to deterioration, thus it is necessary to consider this subject before select the stones as building facade. In this research, alteration index and alteration velocity were be used to evaluate the durability of travertine against Magnesium sulphate that can be used as criterion in salt crystallization test. For this purpose, fifteen travertine were sampled from different areas in Iran then petrologic, some chemical (density, porosity and water adsorption) and mechanical properties (uniaxial compressive strength and tensile strength) were obtained for samples. Salt crystallization test were carried out 60 cycles and alteration index, alteration velocity were calculated for samples based on the weight loss and appearance variation of samples then relationship between alteration index and alteration velocity with effective porosity, tensile strength and weight was analyzed with regression analysis. The results show that alteration velocity has higher correlation with tensile strength, effective porosity and weight loss whereas the alteration index of the travertine is not. Also the results show that fabric, effective porosity and tensile strength are important factors that controll durability of samples in salt crystallization test. جمشیدی، ا.، نیکودل، م.ر.، حافظی­مقدس، ن.، 1387. مقایسه اثر تخریبی محلول­های سولفات سدیم و سولفات منیزیم روی نمونه­هایی از سنگ­های ساختمانی. مجموعه مقالات دوازدهمین همایش انجمن زمین­شناسی ایران، شرکت ملی مناطق نفت­خیز جنوب، اهواز. جمشیدی، ا.، نیکودل، م.ر.، خامه­چیان، م.، ذلولی، ا.، 1391. ارزیابی دوام تراورتن قرمز آذرشهر در مقابل یخبندان و تبلور نمک با انجام آزمون­های آزمایشگاهی. مجموعه مقالات سی و یکمین گردهمایی علوم زمین،­ سازمان زمین­شناسی و اکتشافات معدنی کشور. Angeli, M., Heber, R., Menendez, B., David, C., Bigas, J.P., 2010. Influence of temperature and salt concentration on the salt weathering of a sedimentary stone with sodium sulphate. Engineering Geology, 115: 193-199. Benavente, D., Garcia del Cura, M.A., Fort, R., Ordonez, S., 1999. Thermodynamic modeling of changes induced by salt pressure crystallization in porous media of stone. Journal of Crystal Growth, 204: 168-178. Benavente D, Garcia del Cura MA, Bernabeu A, Ordonez S., 2001. Quantification of salt weathering in porous stones using experimental continuous partial immersion method. Engineering Geology, 59; 313–25. Benavente, D., García del Cura, M.A., Fort, R., Ordóñez, S., 2004. Durability estimation of porous building stones from pore structure and strength. Engineering Geology, 74: 113-127. Benavente, D., Martinez, J., Cueto, N., Cura, M.A, 2007, Salt weathering in dual-porosity building dolostones, Engineering Geology, 94: 215-226. Chafetz, H.S., Folk, R.L., 1984. Travertines: depositional morphology and the bacterially constructed constituents. Journal of Sedimentary Petrology, 54 (1): 289–316. Cultrone, G., Luque, A., Sebastián, E., 2012. Petrophysical and durability tests on sedimentary stones to evaluate their quality as building materials. 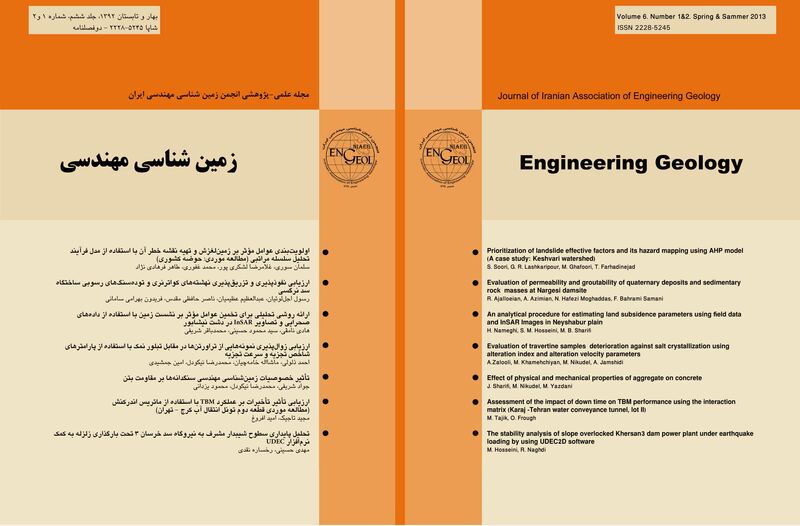 Quarterly Journal of Engineering Geology and Hydrogeology, 45: 415-422. Dreesen, R., Dusar, M., 2004. Historical building stones in the province of Limburg (NE Belgium): role of petrography in provenance and durability assessment. Materials Characterization 53: 273– 287. IAEG, 1979. Classification of rocks and soils for engineering geological mapping. part 1: Rock and soil materials. Bulletin Association Engineering Geology, 19, 364–371. RILEM, 1980. Recommended tests to measure the deterioration of stone and to assess the effectiveness of treatment methods. Commission 25-PEM. Materials and Structures, 13: 175–253. Rodriguez-Navarroa, C., Doehnea, E., Sebastianb, E., 2000. How does sodium sulfate crystallize? Implications for the decay and testing of building materials. Cement and Concrete Research, 30: 1527- 1534. Ruedrich, J., Siegesmund, S., 2007. Salt and ice crystallisation in porous sandstones. Environmental Geology 52: 225-249. Scherer, G., 1999. Crystallization in pores. Cement and Concrete Research, 29: 1347-1358. Schneider, C., Gommeaux, M., Fronteau, G., Oguchi, C.T., Eyssautier, S., Kartheuser, B., 2011. A comparison of the properties and salt weathering susceptibility of natural and reconstituted stones of the Orval Abbey (Belgium). Environmental Earth Scinces, 63: 1447–1461. Sousa, M.O., Suarez del Rio, M., Calleja, L., Argandona, V., Rodriguez, A., 2005. Influence of microfractures and porosity on the physico-mechanical properties and weathering of ornamental granites. Engineering Geology, 77: 153-168. Tsui, N., Flatt, R., Scherer, G., 2003. Crystallization damage by sodium sulfate. Journal of Cultural Heritage 4: 109–115. Ulusoy, M., 2007. Different igneous masonry blocks and salt crystal weathering rates in the architecture of historical city of Konya. Building and Environment, 42: 3014-3024. Urosevic, M., Pardo, E., Cardell, C., 2010. Rough and polished travertine building stone decay evaluated by a marine aerosol ageing test. Construction and Building Materials, 24: 1438-1448. Yavuz, A.B., 2006, Deterioration of the volcanic kerb and pavement stones in a humid environment in the city centre of Izmir, Turkey. Environmental Geology, 51: 211-227. Yavuz, A.B., Topal, T., 2007. Thermal and salt crystallization effects on marble deterioration: Examples from Western Anatolia, Turkey. Engineering Geology, 90: 30-40. Zedef, V., Kocak, K., Doyen, A., Ozsen, H., Kekec, B., 2007, Effect of salt crystallization on stones of historical buildings and monuments, Konya, Central Turkey. Building and Environment, 42: 1453-1457.